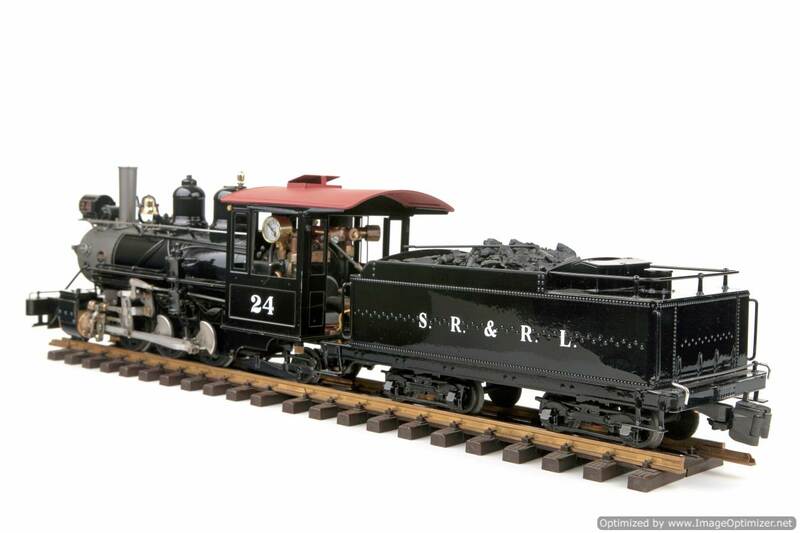 #24 was built by Baldwin at their Philadelphia works in 1919 for the Sandy River and Rangely Lakes Railroad in Maine, USA. 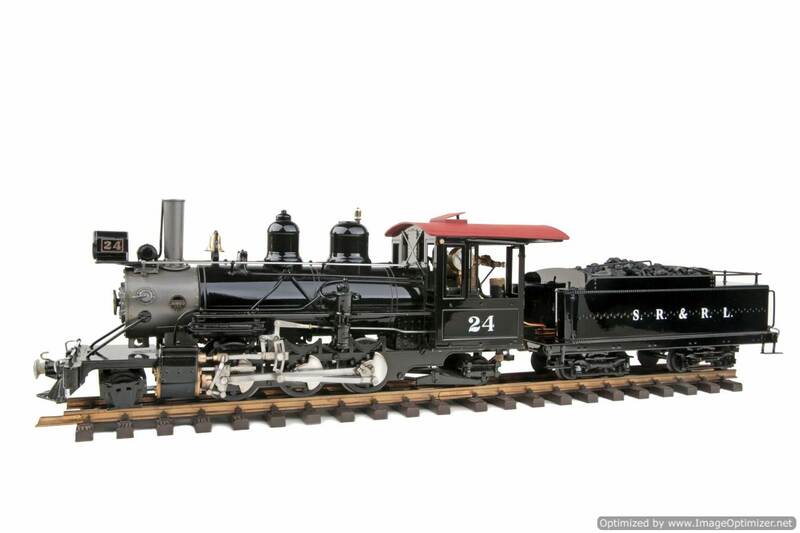 It was the last locomotive bought by the railroad, was over 46 feet long, weighed an impressive 43.75 tons and had a tractive effort of 10,115 lbs. Despite the fact that it was considered an excellent piece of motive power, it was sadly scrapped in 1936 along with the rest of the railroad. 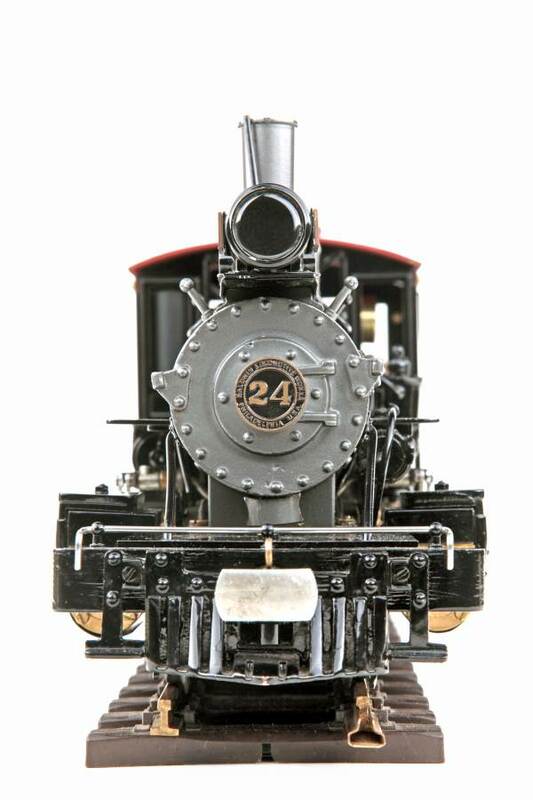 This superbly detailed model is of the locomotive as running in the 1920’s. Although measuring 28″ (700mm) long, it will still negotiate track down to 600mm (2′) radius, thus allowing operation on all LGB track. A water top-up system is incorporated into the model with water gauge on the boiler allowing continuous steaming for long periods and a fully sprung chassis is used on the locomotive with compensated bogies on the tender. 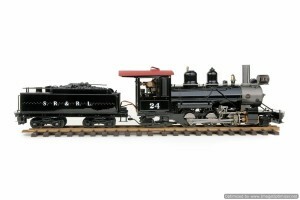 2-6-2 outside framed chassis with two double acting slide valve cylinders. Walschaerts type valve gear . Internal gas firing. Weight 4.25 Kg – loco, 1.75Kg – tender (with r/c). 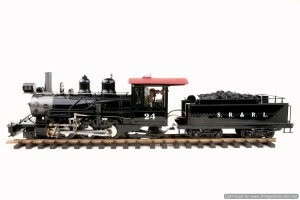 Supplied in black livery with/without silver grey smokebox and red oxide roof unless otherwise stated. Also available in any standard ROUNDHOUSE colour.